Addiel is a Ph.D. candidate in Ecology and Sustainable Development from Belize. He is studying connectivity produced by bonefish movement between a sub-tropical estuary and the Caribbean coast of Belize and Mexico. Addiel received an Associate’s Degree in Marine Science and a bachelor’s in Biology. 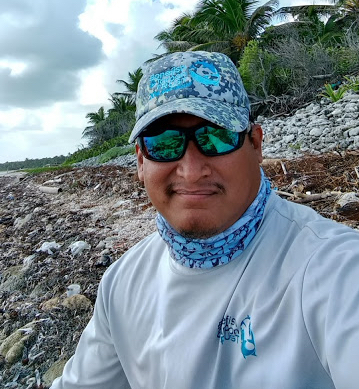 After working for two years as the manager for South Water Caye Marine Reserve, he pursued a Master’s degree in Natural Resources and Rural Development with an orientation in management in Mexico. During his Master’s studies, he developed a technique called Mixed-Methods Approach, which is a combination of techniques such as traditional ecological knowledge, creel surveys, interviews, workshops, and ethnographic notes in coastal fishing communities, which is used to characterize the recreational-sport fishing of Belize. This similar approach is being used in Belize and Mexico to understand bonefish migration, local movements, pre-spawning sites and how environmental variables influence these. Addiel was born and raised in the small fishing community of Sarteneja, Belize, and serves as a board member of the Sarteneja Alliance for Conservation and Development, a non-profit organization that co-manages Corozal Wild Life Sanctuary in Belize.